Open-rangeland view of canyon of Upper Big Antelope Creek in the Upper West Little Owyhee Wilderness Study Area, June 8, 2017, by Greg Shine, BLM. 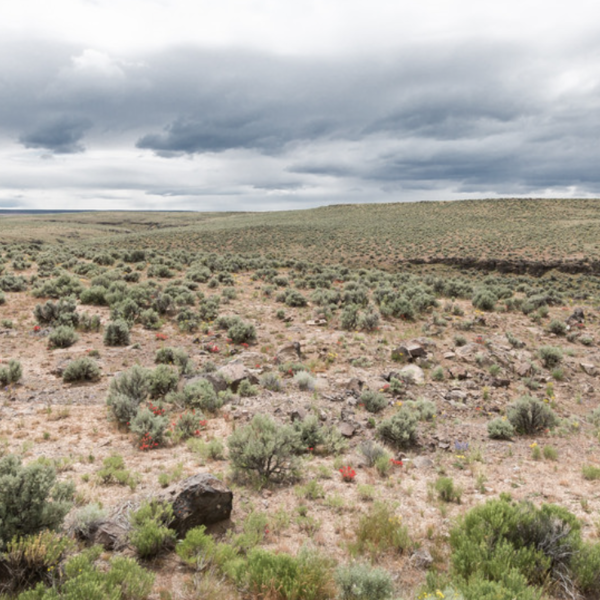 The Upper West Little Owyhee Wilderness Study Area (WSA OR-3-173) is located in Malheur County, approximately 80 miles south of Jordan Valley and 10 miles northeast of Nevada. U.S. Highway 95 lies 10 miles west of the WSA. The WSA includes 58,660 acres of BLM lands. In addition, there are seven parcels of split estate lands totaling 3,840 acres, and a private parcel within the WSA boundary. The WSA is bounded on the north and east by high standard dirt roads and on the south by a low standard road. The western boundary is defined by a fence line and the McDermitt Indian Reservation. The WSA contains level-to-rolling sagelands dissected by two deep, rimrock-lined canyons cut by the West Little Owyhee River and Antelope Creek. Eighteen miles of the West Little Owyhee River within the WSA were designated as a Wild River by Congressional action in October 1988. During the dry summer season, the water in the canyons recedes and is concentrated in deep, clear, cool pools where the canyons narrow. Jeffs Reservoir is located within Massie Canyon, a tributary to the West Little Owyhee. Sagebrush and grasses are the dominant plants in the WSA. Sedges and rushes grow in the riparian zones, patches of mountain mahogany appear on a few of the canyon rims, and isolated pockets of aspen grow on the slopes between the rim and the creek bed. Historically, the Fort McDermitt to Silver City and Winnemucca Wagon Road ran along portions of Big Antelope Creek in the area. Parts of this route have had continuous use and exist now as two-track and gravel roads, while other parts can still be seen today and used for hiking and walking. Any time of transition brings new opportunity. As a new administration settles in Washington and legislators embark upon a new Congress, there is an opportunity to address environmental challenges and economic obstacles related to the management of the nation’s land, water, and other natural resources. When it comes to land management, the U.S. Department of the Interior plays the widest-ranging and most crucial role of any department of the federal government. Controlling such a vast amount of territory and resources is a major responsibility and a difficult one. In this PERC Public Lands Report, we outline eight policy ideas that would harness the power of markets and property rights to deliver environmental and economic improvements for the lands, waters, and other resources under the control of the Department of the Interior.